Discover the next generation of conditioners: New Dove 1 Minute Super Conditioner is Infused with the transformative power of serum capsules that deeply penetrate the hair to repair from within. Dove 1 Minute Super Conditioner Intense Repair helps to smooth visible signs of damage*** in 1 minute, as it is quickly absorbed into your hair, without leaving it sticky or greasy. For recovered, beautiful and resilient* hair. Undo the damage in just 1 minute. Strike a pose to show “1” with your Dove 1 Minute Super Conditioner and post on facebook and Instagram. Don’t forget to include hashtags #DoveSG1min #DoveSG. The most creative winner walks away with a $50 Dove gift hamper! Quick way that makes my hair really smooth and soft! Smells great too, love it! I use a couple of hair treatment from other brands but this dove product surprised me the most. First of all, the scent is great, it's like walking out of the hair salon after a hair spa session. Secondly, most hair treatment products required more than 5 mins usage. This product is only 1 min and yet gave better effects than some other brands. 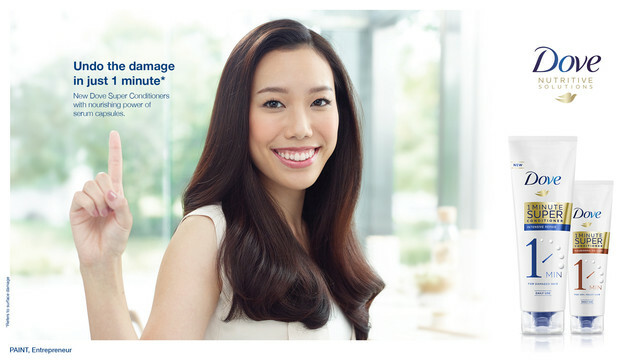 Thirdly, you know how some hair treatment products will make your scalp oily after half a day. This dove product do not have that problem at all but provided it is 1 min usage. I tried using the product for 5 mins one day, my scalp turned oily after half a day. This product makes the hair light and soft. Strongly recommended.